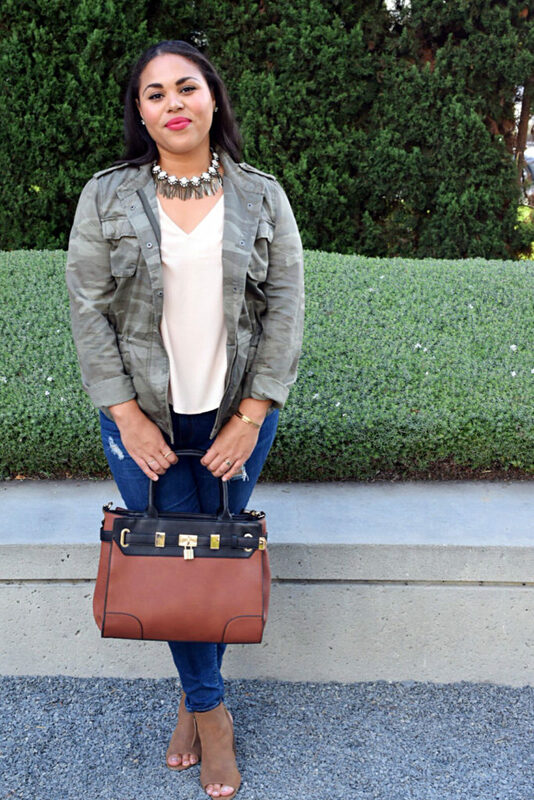 Camo is such a versatile print that’s perfect for fall. The rich neutral and green hues are super pretty, and they match just about everything. 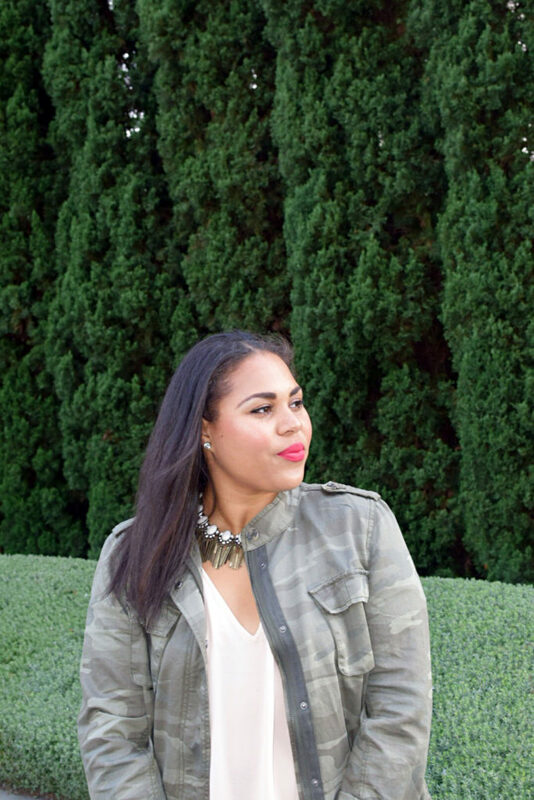 When I found this camo cargo jacket, I knew the possibilities to wear it would be endless! 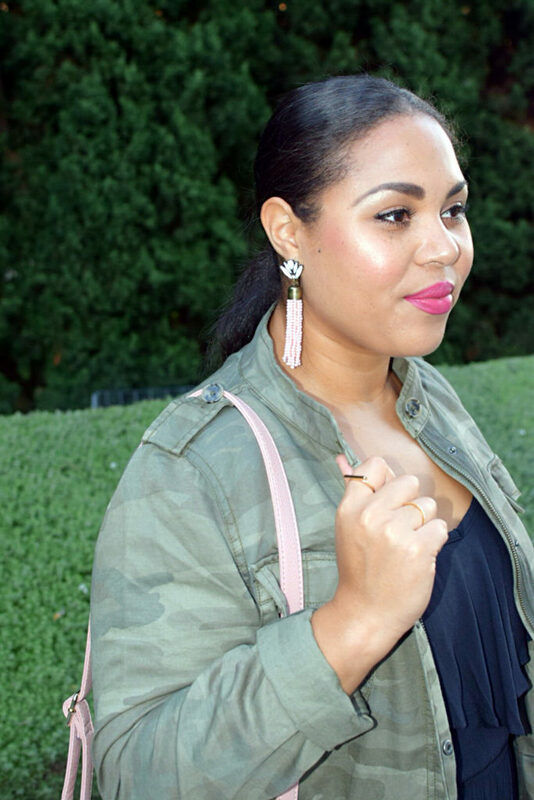 Today I’m going to show you guys how I style camo by giving you three different ways to wear it this fall, because every gal needs a good camo jacket. This military-inspired jacket is a soft twill fabric with a drawstring waist, and has several large pockets and button cuffs. I sized up and I’m wearing an XL, but if you want less of an oversized fit, order your normal size (but keep in mind it runs small in the arms). It’s also currently 50% off! 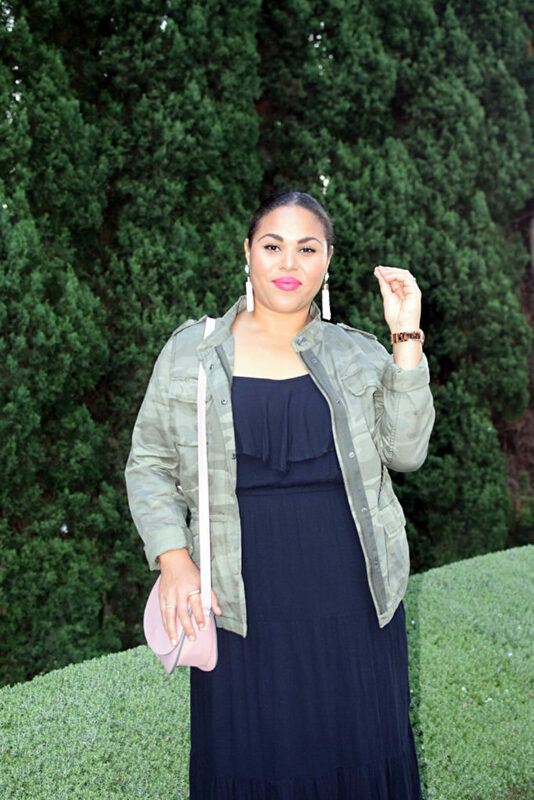 Scroll down to see all the ways I’ve styled this cargo camo jacket. Who said camo couldn’t be girly? 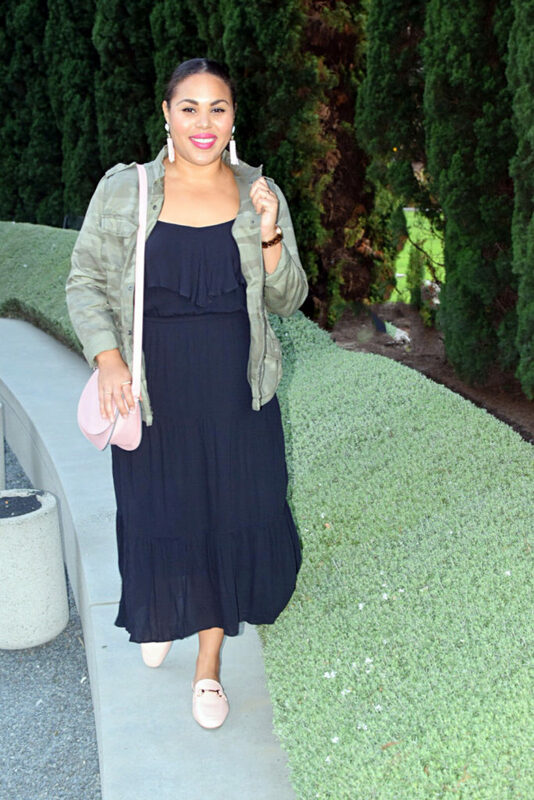 Pairing this camo jacket with a ruffle midi dress and light pink details gives it an ultra feminine vibe that’s very true to my style. 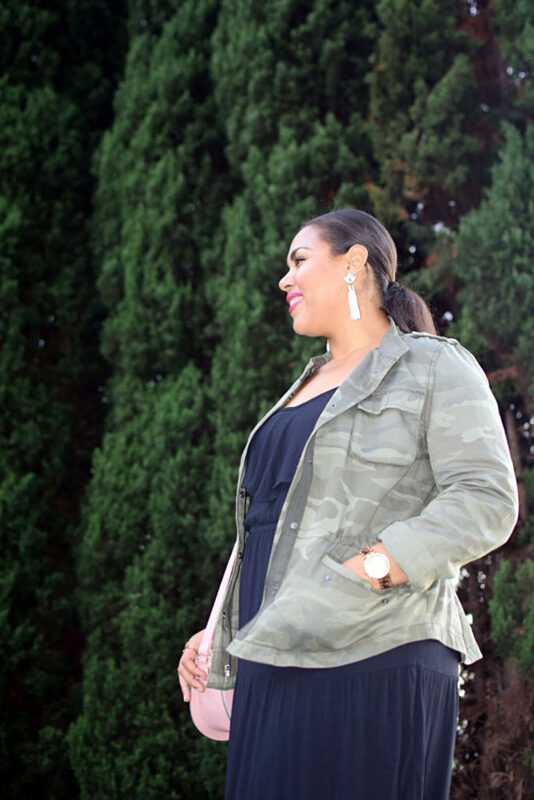 (under $26) really pulled the whole look together and made this outfit so comfy! This look would be perfect to wear to work, date night, site seeing in a new city or a day of shopping. 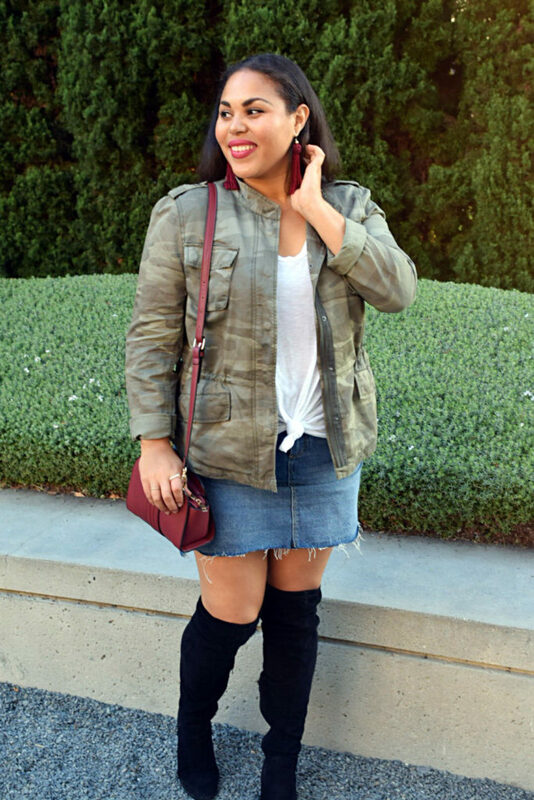 For this look, I decided to take a more edgy and chic approach by pairing the camo jacket with a denim skirt, over the knee boots and maroon details. 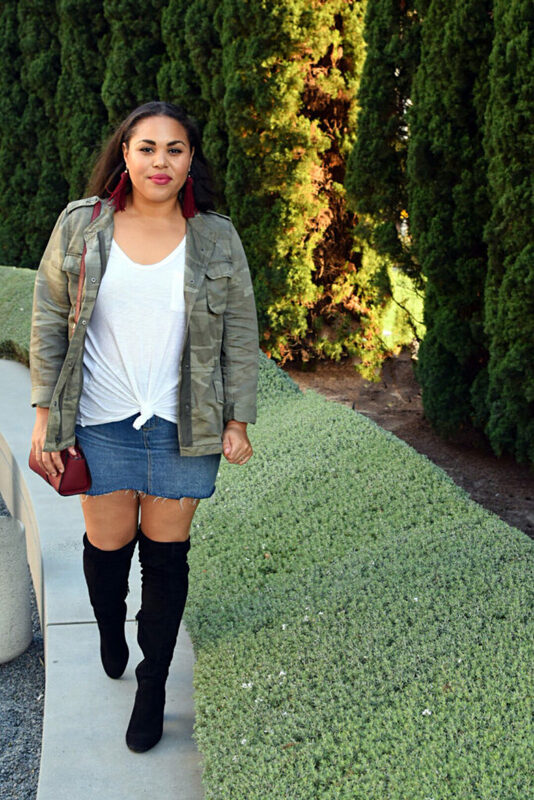 The denim mini skirt and OTK boots work perfectly with this oversized jacket, and make it all feel very cool. 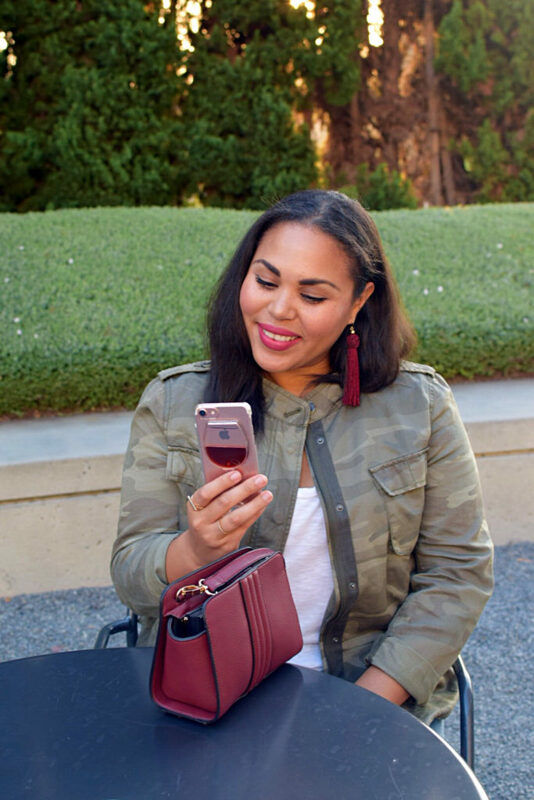 Maroon/burgundy is such a great color for fall and looks really pretty with the rich, neutral tones in this camo jacket. I felt so confident in this look, and can see myself wearing this to a party, happy hour, out shopping, or on a date. 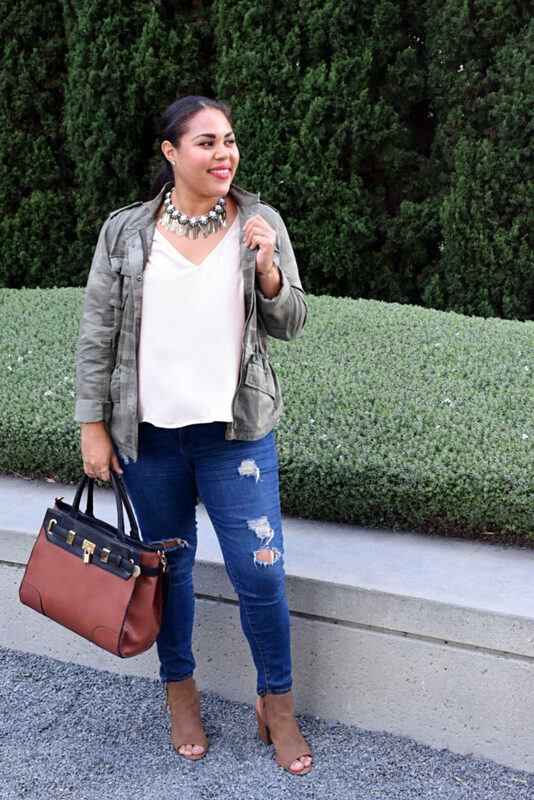 This last look pairs neutral tones, ripped denim jeans and camo together in perfect harmony. 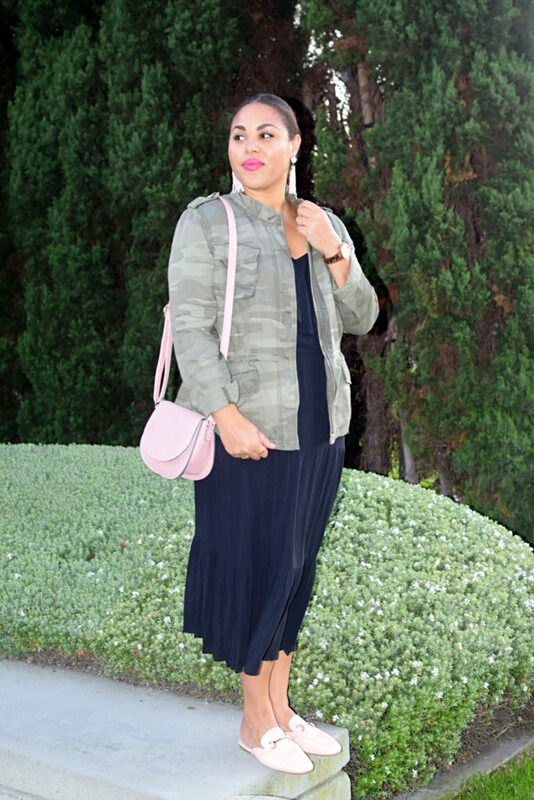 It’s definitely the most simple way to wear the camo jacket, but sometimes simple is better! 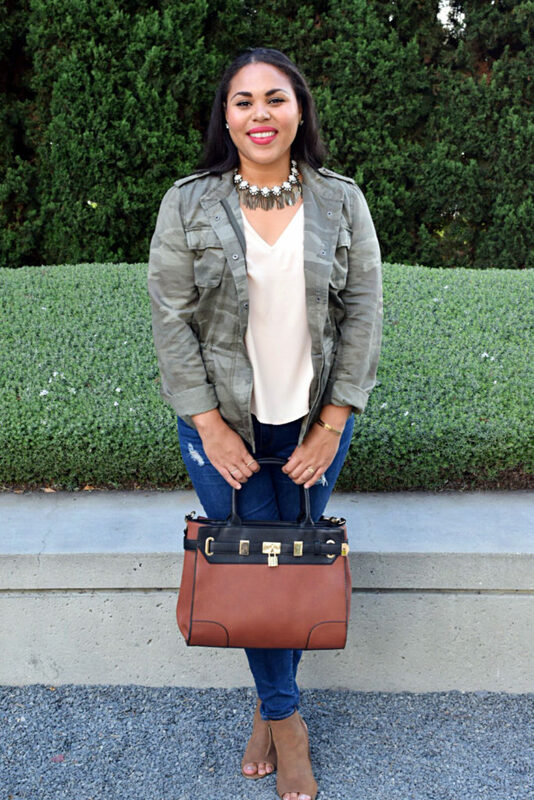 Wearing this jacket with nudes and gold tones is an easy way to create a super chic look, and the statement necklace with ivory-like stones and brass tassels tied everything together. I also love my cognac and black tote with this look, and firmly believe that mixing black and brown is 100% kosher! This would also look great with black or white jeans. This outfit would be great to wear to work, brunch or on a day-date. Which look was your favorite, and how would you style this camo jacket? 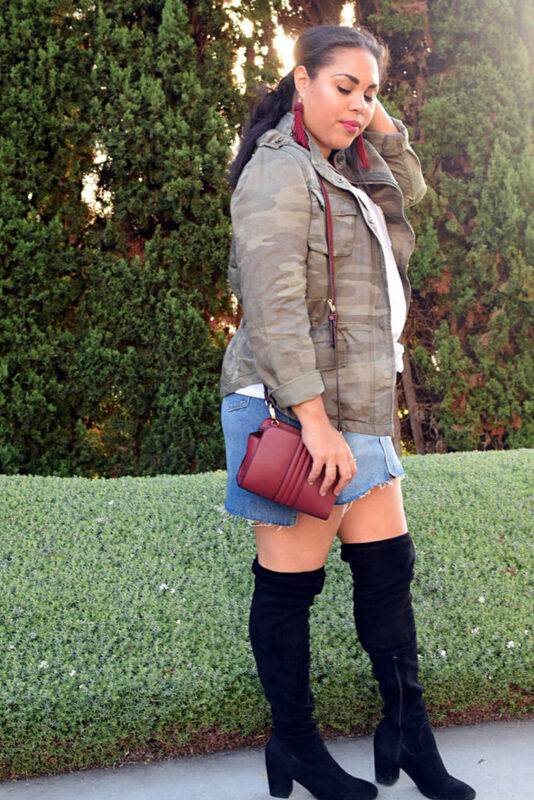 tbh i really didn’t think i could pull off camo, but i’m looooving that last look with the jeans and booties! so perfect for fall!!! It’s my first time owning and wearing any camo, and I love it! I was definitely skeptical, but it was surprisingly so versatile. 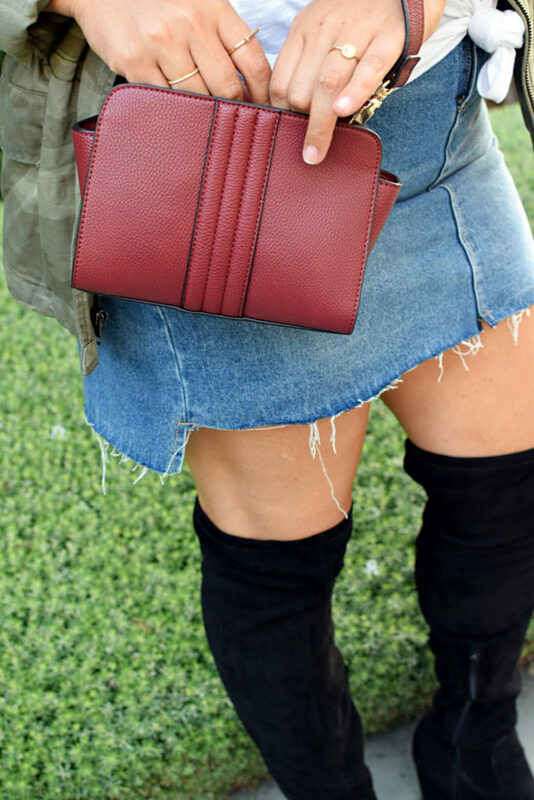 That last look is perfect for fall! Thanks so much for your comment girl ?